Looking for a little something sweet, an afterschool treat, or a way to get out of making those cupcakes for the bake sale that you promised? Check out the newest addition to Katonah this weekend! 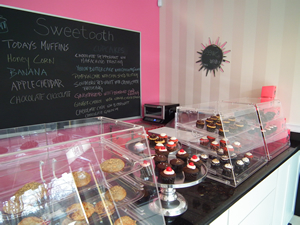 On Sunday, January 29th, from 1-3pm, stop by Sweetooth Katonah for their Grand Opening. Try some delicious samples and meet the owner, Stacie Calian and the executive pastry chef, Kaitlyn Lennox, a CIA graduate. The store is located at 43 Katonah Avenue, Katonah. Besides cupcakes, the store has muffin tops, Ronnybrook products, coffee and can do special orders with 48 hours notice. Sweetooth of Katonah is committed to using the finest quality ingredients, sourced locally whenever possible. Cupcake flavors change seasonally and are baked fresh daily. Sweetooth is a nut free facility and any and all dietary restrictions can be accommodated (including Gluten free items). For more information, visit www.sweetoothkatonah.com or call 914-232-7700.